The Paul and Betty Yoder Foundation recognizes that life and career stresses can erode the confidence of even the most talented and successful women. It is the mission of this Foundation to help these women regain control of their lives as they create the future that brings them personal satisfaction and financial independence. The Foundation assists mature women who realize they need to make a significant change in their career or life situation, but do not have the financial resources to take action. Educational Grants or Special Consideration Grants are awarded to worthy women who have identified a specific goal they want to pursue. 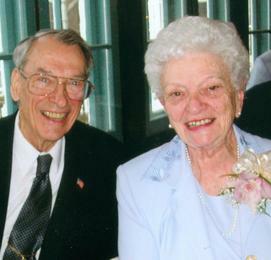 Paul and Elizabeth "Betty" Yoder, former residents of Norwalk, CT have four children and five granddaughters. Their daughters, Marty Yoder of Newtown Square, PA and Carol Yoder of Norwalk, CT recognize the impact their loving parents had on their ongoing success. In appreciation of the many sacrifices, encouraging support and generous nature of their parents, Marty and Carol created this Foundation in their honor. Click here to learn more about Paul Yoder and Betty Yoder. Created in 2000, the Paul and Betty Yoder Foundation is a private, charitable trust. All contributions are tax deductible.